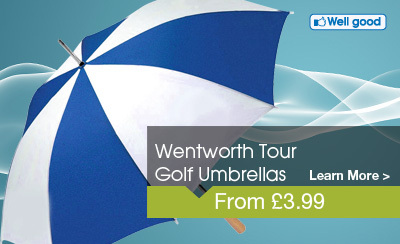 When it comes to big, noticeable branded products, you cannot get much bigger than promotional golf umbrellas. No matter where the user is when opening one up, people far and wide and prospective customers and clients are sure to see your company logo or name boldly printed on these very visible business promotional golf umbrellas. Whether your clients are walking their children to school in the rain, keeping their groceries dry while waiting for the bus, or hiding from the sun at a golf tournament, numerous people that could be your potential customers will become a bit more familiar with your brand each time the recipients of your printed golf umbrellas put them to use. Obviously, the main use of promotional golf umbrellas is to keep dry on the ourse, so there is no better place to hand them out than on corporate golf days! Give you customer's a day they will enjoy and a gift they will find useful with a all expenses paid golf day and promotional golf umbrellas!